I may be back stateside, but the story of this year’s Japan trip isn’t over yet! Kindly indulge me as I relive the last few days of our trip around Japan this winter season. Matsuyama is one of Devin and Shawn’s most favorite place to visit in Japan owing to the beautiful scenery and lovely people that call this area home. It is rather difficult to get to if you were flying in from America, but it has made itself a place that is worth visiting if you had the opportunity to. In the past, Matsuyama area had a thriving Koi scene with many serious hobbyists supporting breeders and dealers of notable caliber. But over the years, the focus has shifted primarily to the north with the exception of Sakai Fish Farm and Omosako Koi Farm in the south. Beppu Fish Farm, however, makes the trip worthwhile. 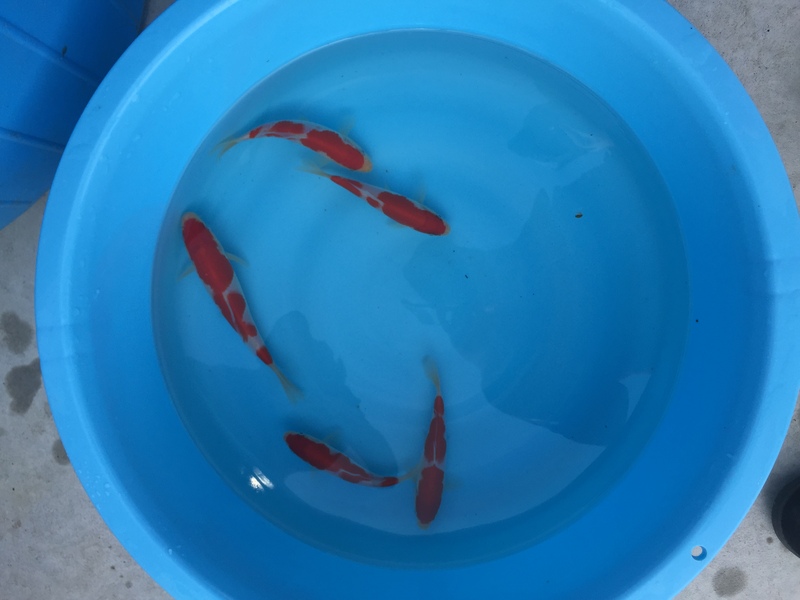 They are quite hospitable, but more than that, the quality of Koi that they produce is one that not only looks good today, but also holds much promise for the future. 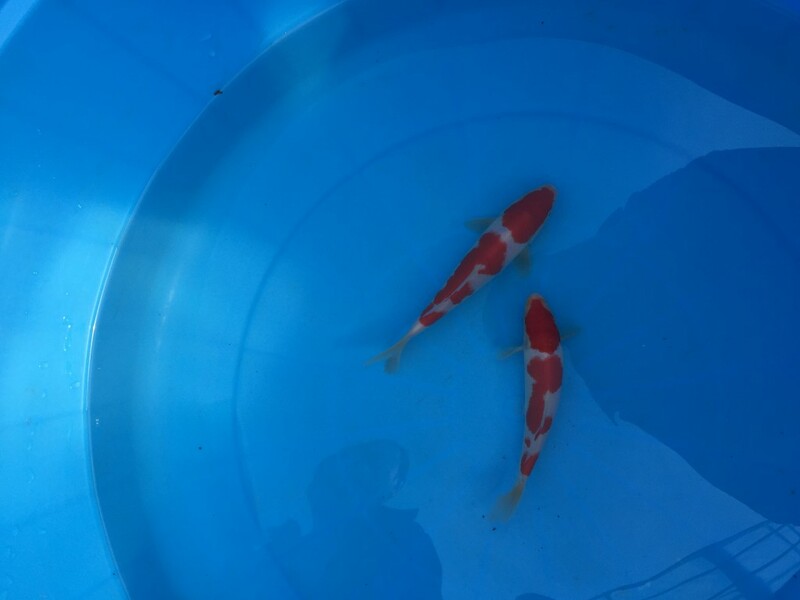 They are a small farm, so availability is quite limited, but those who are fortunate enough to own a Koi of their production know that theirs is a bloodline is consistently delivers on its promised potential as it ages. Takaharu is the youngest brother of the Inoue family who is behind Beppu Fish Farm, and the family has a good relationship with Sakai Fish Farm. Most of their brood stock comes from Sakai and Takaharu trained at that farm for five years before returning home to help run his own farm. Because of this relationship with Sakai Fish Farm and the parent stock mostly coming from them as well, we have seen the many similarities in growth potential and quality of skin that Beppu Fish Farm and Sakai Fish Farm shares. While we were at Beppu’s place, Shinsuke arrived together with his customer from Indonesia to select some high-quality tosai. Since we were all there for the same thing, all the high quality tosai that were available for sale were brought outside the greenhouse so that there was more space for all of our selection bowls to fit and so that we can see all the Koi in good light. 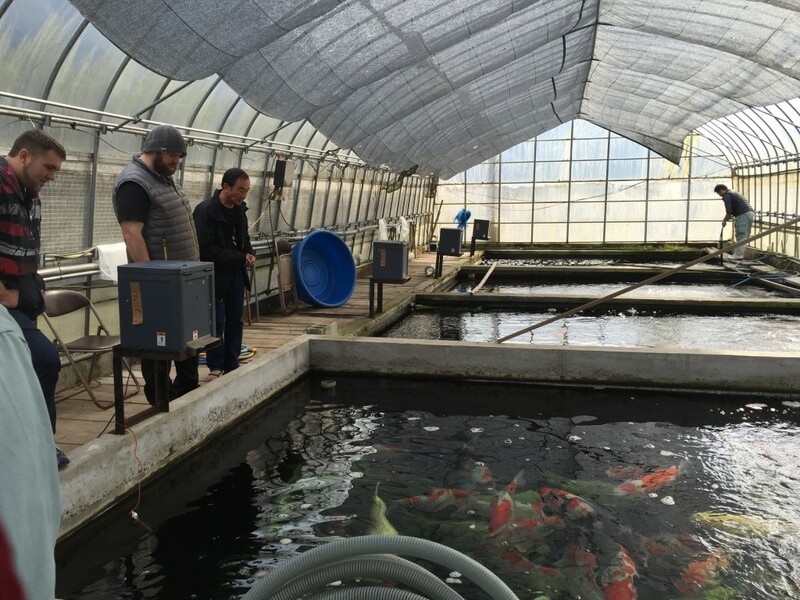 The Koi were brought outside of the greenhouse in batches and each of us selected Koi one at a time taking turns. There was a lot of laughs between all of us, which made for a very enjoyable afternoon. When selecting Koi in this type of situation, your skill as a professional and your eye for Koi is really put to the test. 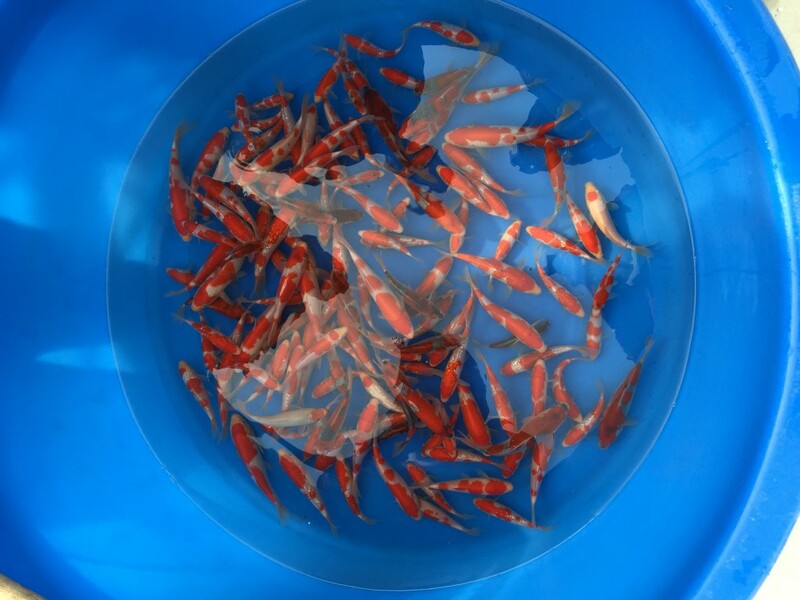 You have to first be quick in spotting the best Koi for your farm so that you get the best value for your money, but also make sure that what you are selecting is something that is pleasing to your market. 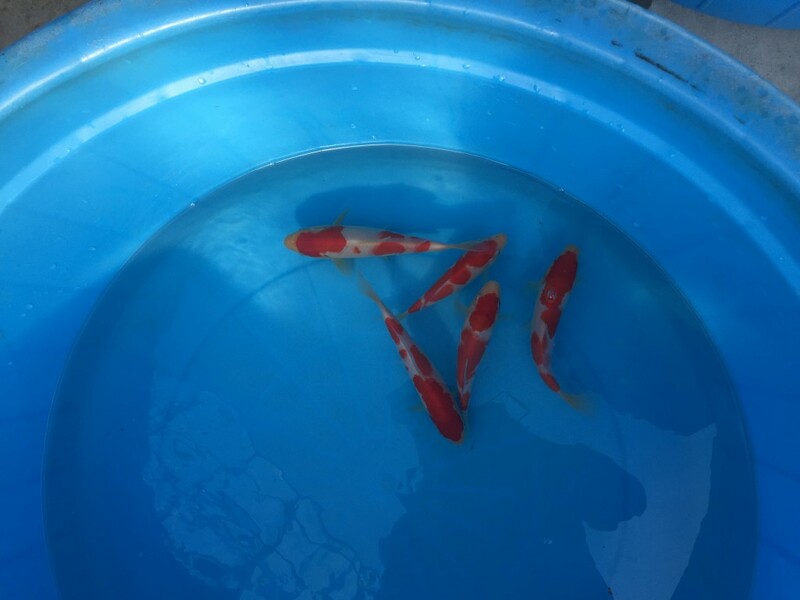 Since you are each taking turns picking one Koi at a time, you also have to be smart about which Koi you pick at what point in the selection process. 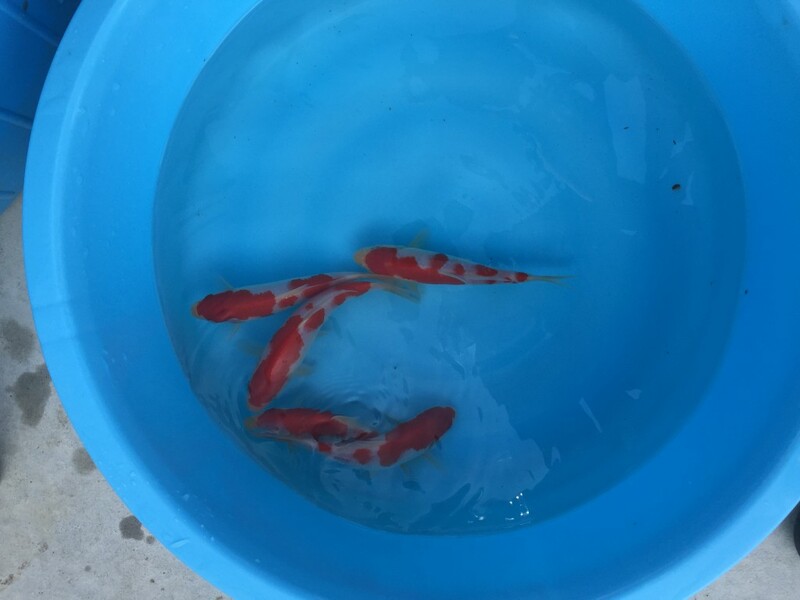 If there is one Koi that catches your eye early on, but you know wouldn’t be the first choice of the other people selecting from the same bowl as you, it would be wiser to hold off on that selection for a later turn and first select the Koi that you feel would be interesting to both you and the Koi professional next to you. 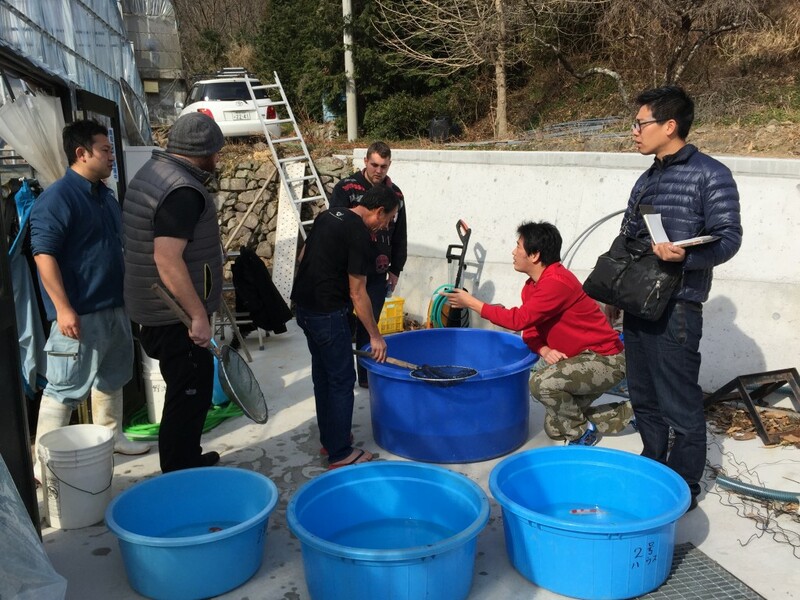 Understanding the quality of Koi that you are looking at is something that a dealer must master early on in their career. Taking the time to weigh the cost of the fish against its quality might cost you a great deal-or make you pay too much money for what you are getting. That is why it is so important that when you are buying Koi-whether at your local dealer or in Japan-that you have absolute faith and trust in the Koi professional that you are working with. 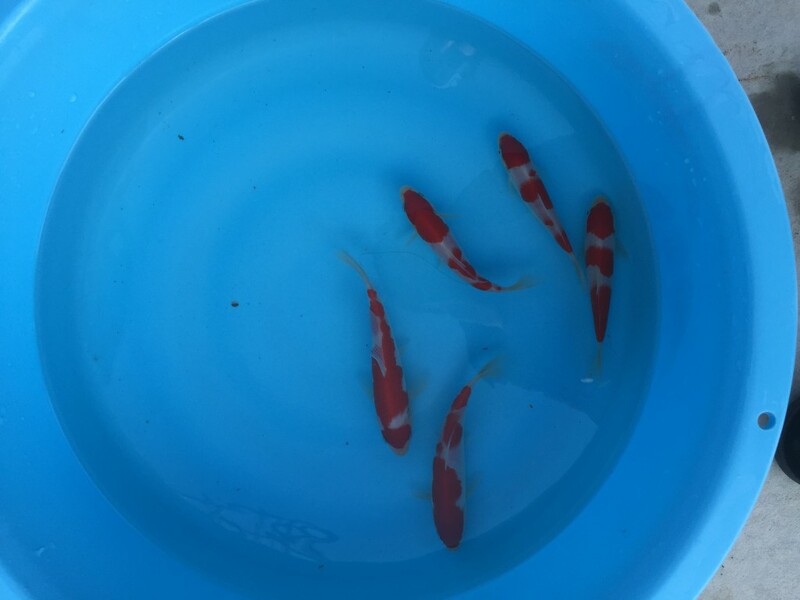 One of their most important role in assisting the Koi hobbyist is to help them understand the caliber and true value of their Koi. Devin and I have something very special planned out for these selected tosai to be announced very very soon! It’s been in the works for a few years now and we are finally seeing it come to fruition this spring season. Hint: we gave everyone a little taste of what we have in store this year when we announced the Japan Grow Out contest event. But I’ve said too much already… I wouldn’t want to spoil the surprise too much! Next up: See the fantastic Showa offerings of Ueno Koi Farm and a special reunion with our friend Shohei from Takatsu Koi Farm!